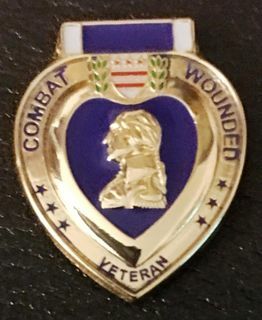 LZ NAM's very own Purple Heart Combat Wounded Veteran hat pin...unique and beautifully designed in 3 D which really makes this pin pop! This pin is also mounted on our Ratchet/Buckle...one of a kind. The pin is 1 1/8 inches in total length from top to bottom and comes with two clutch backs.